Are your employees walking out the door? Do you really know what your employees are thinking? 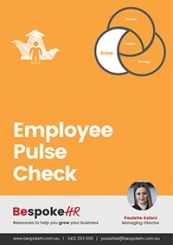 Survey employee satisfaction with the free employee Pulse Check template to learn what employees are thinking, why they stay or why they are leaving. Often the real reasons employees are running out the door are different to what we hypothesise. Rather than wait for them to leave, why not find out before they make the decision to jump ship.